Arnott and Vederoff Ancestors - Photo of mountains and meadows in Gunnison County, Colorado, where one branch of the Arnot/ts went when they left Scotland. Photo was provided to this researcher by Ede Trockels and was taken in 2011. 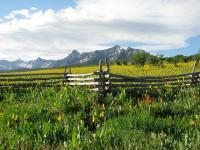 Photo of mountains and meadows in Gunnison County, Colorado, where one branch of the Arnot/ts went when they left Scotland. Photo was provided to this researcher by Ede Trockels and was taken in 2011.